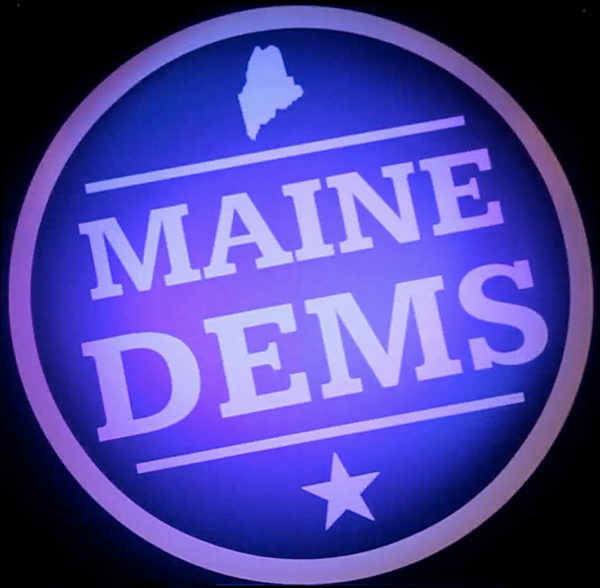 The Maine Democrats' logo is projected on a big screen at the Maine Democratic Convention in Augusta Saturday, June 2, 2012. LEWISTON, Maine — The mostly polite rift in today’s Democratic Party may best be embodied by a quiet couple from Auburn who went out on Wednesday evening in search of their next standard-bearer in Maine, yet walked away with no clear leader. Term-limited Gov. Paul LePage will be replaced in the wide-open 2018 gubernatorial election. Democrats hope it will end a poor eight-year run for their party, which largely dominated Maine politics for 40 years before the Republican governor’s victory in 2010. Already, nine Democrats are running for the Blaine House. Six of them — all of the well-known hopefuls except Attorney General Janet Mills — and a prospective candidate were at an event run by the progressive Maine People’s Alliance in Lewiston’s Bates Mill on Wednesday. That’s where Ben and Anna Low, both 44 and of Auburn, came to find their candidates. Both were open-minded about the field and represent different wings of their party at a time when it’s uncertain what the base wants and whether who they want can win. Overall, Maine’s 2016 presidential election was won by Democrat Hillary Clinton. But Republican Donald Trump won the 2nd Congressional District and Clinton never had Democrats’ hearts. Maine’s caucus was won easily by Vermont Sen. Bernie Sanders. Ben Low, a brewer, supported Clinton in the caucuses, saying he wants “a liberal who can win” the Blaine House. Anna, an artist, supported Sanders, saying while she didn’t think he was “the right guy for the job,” primaries are “a chance to push the discussion” in a progressive direction. The two most established politicians in the field are Mills and former House Speaker Mark Eves. There are two relative outsiders with some political experience — lawyer Adam Cote of Sanford, who ran unsuccessfully for Congress in 2008, and former state Sen. Jim Boyle of Gorham. The field also includes two activists — former state Rep. Diane Russell of Portland and lobbyist Betsy Sweet of Hallowell — and three longshots, Patrick Eisenhart of Augusta, J. Martin Vachon of Mariaville and Kenneth Forrest Pinet of South Portland. Mills of Farmington and Eves of North Berwick supported Clinton and resemble the legislators who have carried Democrats’ banner, such as Libby Mitchell in the 2010 gubernatorial race, then-U.S. Rep. Mike Michaud in 2014 and Emily Cain in the 2nd District in 2014 and 2016. However, those three lost the general election, so nervous Democrats may consider Cote, an Army veteran who runs a company promoting thermal energy, or Boyle, who served one term in the Senate and recently sold an environmental consulting business. Those seeking purer progressives may turn to Russell, a Sanders delegate to the Democratic National Convention who led a fight at the convention to abolish the “superdelegates” that Sanders blamed for stacking the nomination deck against him, or Sweet, a former director of the Maine Women’s Lobby. So far, the nascent campaign has been unspecific: Only Cote’s and Sweet’s campaigns agreed to provide lists of prominent supporters for this article. Cote’s list of financial supporters was led by former U.S. Rep. Tom Allen. Portland Mayor Ethan Strimling topped Sweet’s list. The Maine People’s Alliance has published the results of a questionnaire in which major candidates — except Mills, who didn’t answer — mostly agreed on key issues, but the Wednesday event was longer on broad visions. Cote said many of Maine’s economic development constraints are “right up here,” pointing to his head. Eves highlighted a consensus-building approach in Augusta. Boyle talked about closing corporate tax loopholes. Cynthia Dill, a former state senator and Clinton delegate to the national convention from Cape Elizabeth, also said Democrats should focus on jobs and not “hot social issues” like “bathrooms” — a reference to controversies over transgender students’ rights to use public restrooms of their choice — and abortion. “And it requires a leader who’s got the guts to put some edgy ideas out there to meet the moment,” Chin said. Cokie Giles, president of the Maine State Nurses’ Association and a Sanders delegate from Brewer, said her group won’t be endorsing any candidate who doesn’t support a “Medicare-for-all” plan. At least two other Democrats — Lee Auto Malls Chairman Adam Lee of Cumberland and state Sen. Mark Dion of Portland — have said they’re considering runs. Lee, the only prospective hopeful at the Wednesday event, is concerned that Democrats may repeat past mistakes. Last week, he predicted that Democrats would eventually rally around Mills if others didn’t run and said, “I’ll be right there with them getting behind a candidate that probably is the most qualified” but one that “probably cannot win” the general election. “So, it’s kind of grim,” Lee said. By night’s end, the Lows hadn’t found their candidates. Ben said Cote, Eves and Sweet stood out for him, but Anna didn’t want to name names. Both said they saw candidates who can win and that turnout indicated that Democrats are motivated. CORRECTION: An earlier version of this report said five candidates attended the Maine People’s Alliance event in Lewiston on Wednesday. Six declared candidates attended.